Haddon W. Robinson, the American author, theologian, and professor, once told a great story of a young lady who approached her preacher about the sin of pride. The preacher’s reply was a light-hearted attempt to make a point, and help the young lady take a closer look at herself. Of course, pride is a sin. And there’s a need to repent of our sins regardless of their nature. The challenge is that too often we feel that others’ sins are worse than our own. This was apparently the case in the reports Jesus received in Luke 13 about the Galileans slaughtered by the Roman governor Pilate. Jesus answered his own question, by saying, “No.” Then he challenged them with these words, “Unless you repent, you will all likewise perish” (Lk 13:3). To further illustrate his point Jesus referenced the death of 18 people when the tower of Siloam fell on them. We are not familiar with this obscure historical reference, but obviously, his hearers were. Again Jesus asked, were these 18 “worse sinners” than others? Jesus’ point to them and to us is that death comes to all people. God is not inflicting judgment on those we consider “worse sinners” in this life. Righteous people suffer too. Job is a case in point. And while Job’s three friends thought the loss of his wealth, the tragic death of his children and his suffering was the result of his sin, they were mistaken. The fact that some people in this life suffer and others do not, is not necessarily an indication of God’s favor or His punishment. But here’s what is important for all people to understand. God desires that we repent of our sins. In juxtaposition to those who physically perished in these two accounts is something far worse. Perishing spiritually. Dying and not being in a right relationship with God. The word repent literally means “to perceive afterwards.” It implies a change of mind. Of heart. Of will. Of purpose. Repentance is not just for those that we think are “worse sinners.” The Bible teaches that “all have sinned and fall short of the glory of God” (Rom 3:23). While some sins are more obvious than others and may render greater consequences in this life, all sin is an affront to God. Sin impairs our relationship with God. Sin separates us from God. The personal answer to all sin is summed up in one word. Repent. The message of John, the forerunner to Jesus, was “Repent, for the Kingdom of heaven is at hand” (Matt 4:17). Peter’s answer to the question, “What must I do to be saved? Was “Repent and be baptized for the remission of sins.” (Ax 2:37-38). When Simon, the new convert, sinned in Acts 8, Philip reprimanded him and commanded him to “repent” of his wicked thoughts and pray for forgiveness. Jesus presents to us a simple, but fearful choice. 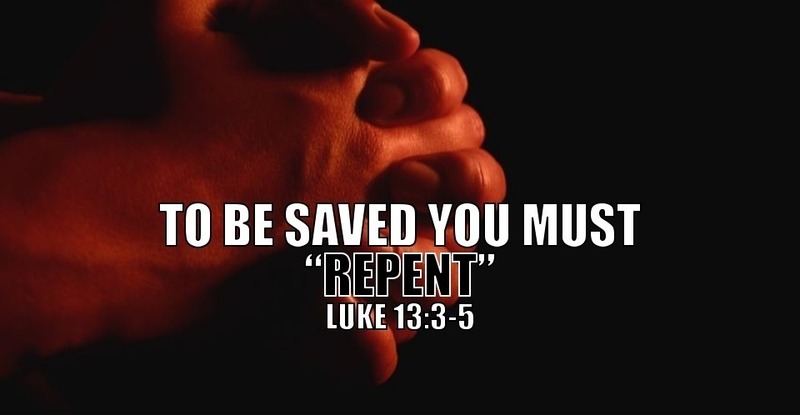 Repent or perish. It is truly the hardest command to obey!